Alan Teach of Sunrise Orchards in Gays Mills, WI wrote in this week asking what the differences are between degree day reports shown on weather station pages (Figure 1). Let’s talk more about degree day models and the differences among those offered on NEWA. Figure 1. Three standard degree day reports are offered on NEWA weather station pages. What is a degree-day model? A degree-day model is used to estimate insect or plant development through different life stages. Basic parameters of a model include the minimum temperature at which growth can occur. This is termed the base temperature or lower development threshold. Sometimes a maximum temperature is also used, called the upper development threshold. The simplest way to calculate degree days is a subtraction of the base temperature from the average temperature over a period of time. Consider the following example. Day X has a minimum recorded temperature of 46F. Maximum temperature was 67F. Insect Y has a minimum development temperature of 50F. We calculate degree days on Day X for insect Y in the following way. 6.5 heat units are calculated for Insect Y on Day X. If temperatures are warmer, more units accumulate. If temperatures are colder, fewer. No heat units are accumulated if degree days are calculated to be less than 0. Development stops but does not reverse. You can also review our overview of degree-day models on the NEWA website. 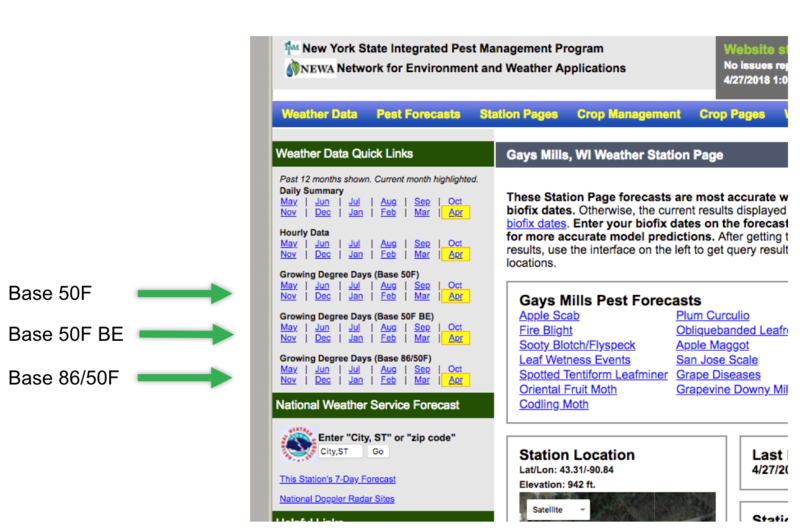 What’s the difference between model reports on weather station pages? Allen’s question asks about differences between base 50F, base 50F BE, and base 85/50F reports. With a better understanding of how degree days are calculated, this question is more easily answered. This model uses a base temperature of 50F. The example above calculated degree days in this manner. This is a common and straightforward method. 50F is also used as the base temperature in this model. BE is a reference to the Baskerville-Emin method of calculating degree days. The calculations look similar to the standard methods at temperatures well above threshold. For example when min temperature is 65F and max temperature is 85F. But Baskerville-Emin is better at calculating accumulation on days where temperatures are close to the threshold. For example, consider a day when the minimum temperature is 40F and the maximum temperature is 60F. A basic degree calculation would show an accumulation of 0. In reality, some degree days are likely to have accumulated because a good portion of the day was in fact above 50F. Base 50F BE accounts for these close margins and should provide a more precise measurement of actual degree-day accumulation. This model is similar to a base 50F model but also restricts accumulation by imposing an upper-temperature threshold. In the same way that degree day accumulation is restricted by a base temperature, accumulation of heat units is restricted when the maximum daily temperature approaches 85F. An 85/50F model is particularly suited to measurement of corn development for example. 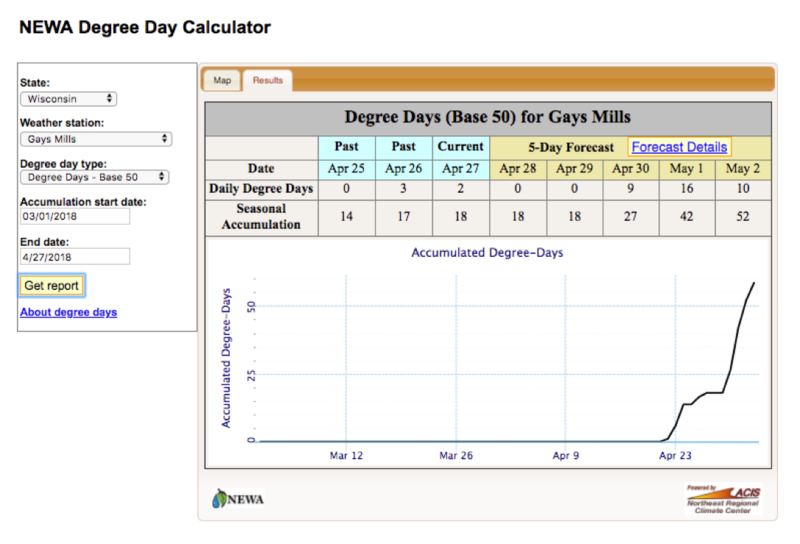 The most common degree-day models are directly available from weather station pages but the NEWA degree day calculator has many more options with a total of 14 available iterations of this model type (Figure 2). Figure 2. 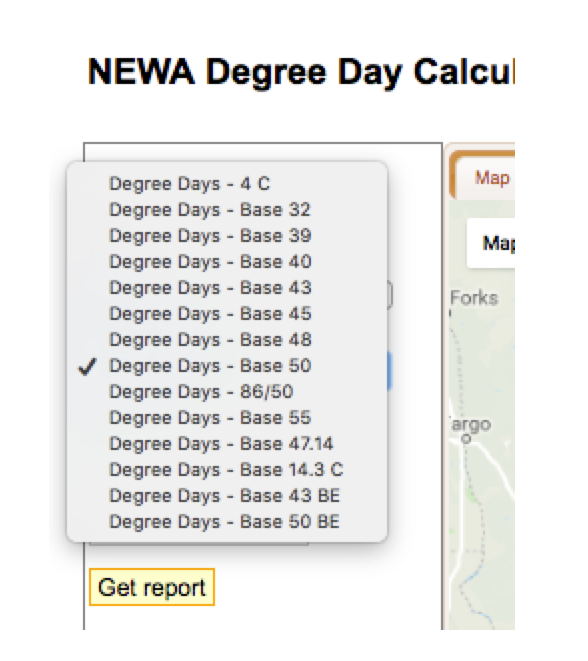 Fourteen degree-day models are available in the NEWA degree-day calculator. Figure 3. Snapshot report of customized degree day calculations from the NEWA degree-day calculator. The output report provides a snapshot of your chosen degree day model accumulation for the past two days as well as a 5-day forecast. This model also works with historical dates, relabeling ‘5-day forecast’ as ‘Ensuing 5-days’ to indicate historical data. If you have an idea or question for the NEWA blog, send a request to support@newa.zendesk.com or submit a request by following the ‘Help‘ link found in the main navigation bar at newa.cornell.edu. This entry was posted in about models, About NEWA, Degree days, information and tagged degree day models, Degree days, difference, NEWA, what are on April 27, 2018 by Dan Olmstead. NEWA has a new online help desk. Use it to share an idea, ask a question, report a website problem, request weather station assistance and more. A ‘Help’ link is located on the right side of the main navigation bar which is accessible from any NEWA page (Figure 1). Click to open a new window and make a request (Figure 2). You can also send a message directly to support@newa.zendesk.com. Figure 1. 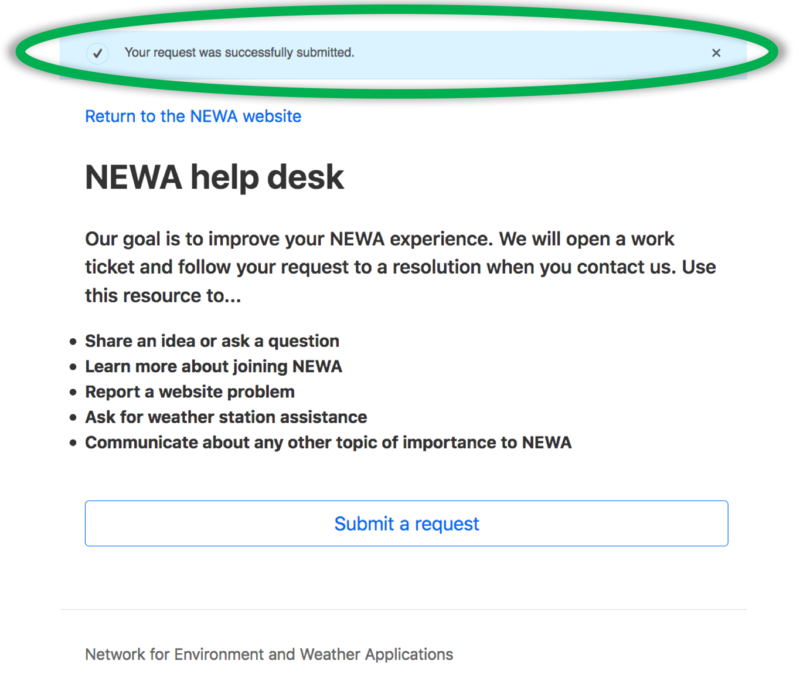 The NEWA help desk can be accessed from the navigation bar on any page. Figure 2. 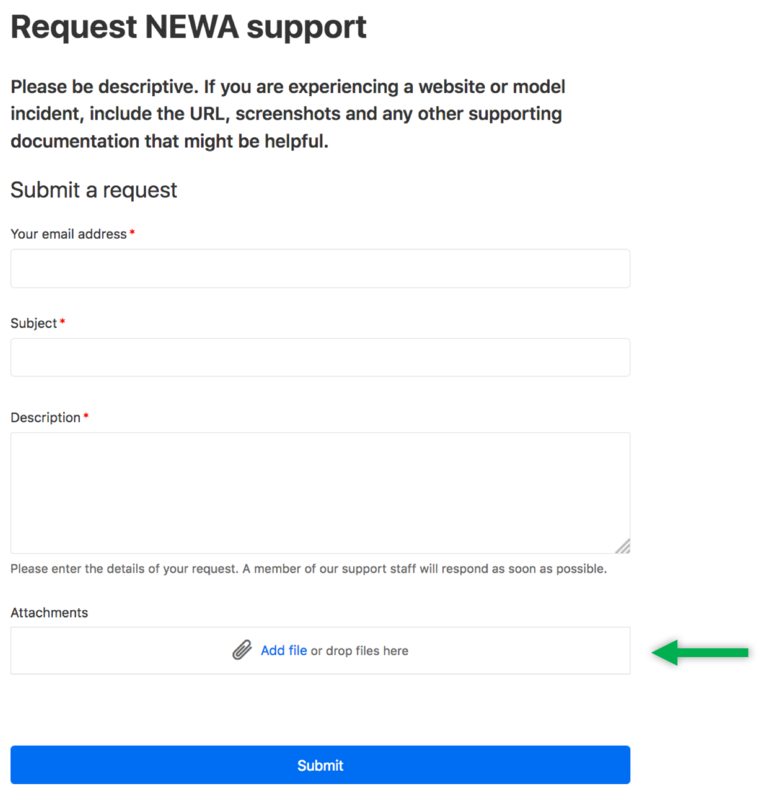 Click ‘Submit a Request’ to contact the NEWA help desk. When the form opens, add a valid email address, subject, detailed description of your question or problem, and any relevant URLs or screenshots which can be uploaded as attachments (Figure 3). Figure 3. Use the help desk form to ask a question, report a problem, or make other NEWA-related inquiries. You will receive confirmation after clicking the form ‘Submit’ button (Figure 4). Figure 4. You will receive confirmation or your request to the NEWA help desk. A unique work ticket will be generated when you submit your request to the NEWA help desk and all subsequent communication will come from support@newa.zendesk.com. We will work closely with you until a resolution is found. 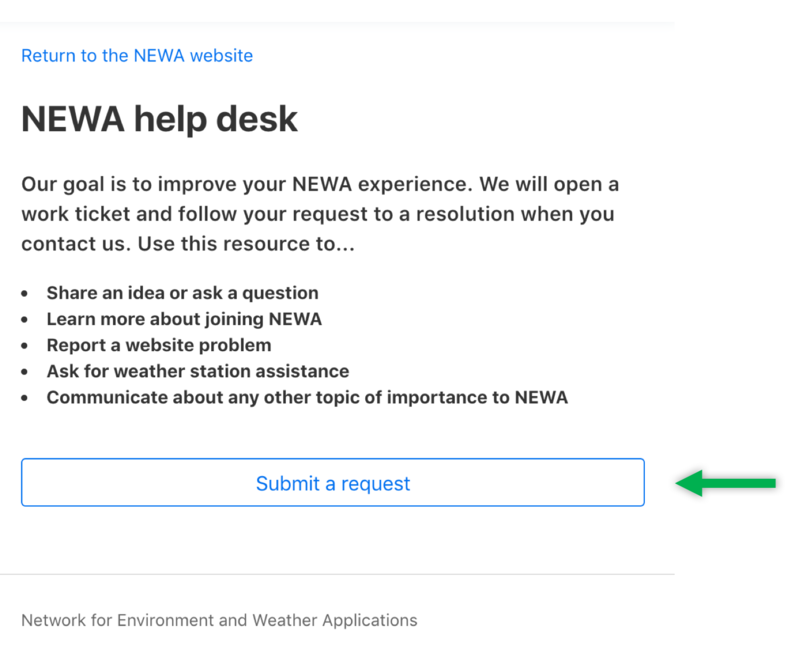 Use the NEWA help desk for anything of importance as it relates to your user experience. This includes general questions or comments, model questions, website issues, weather station issues, and anything else of importance. This entry was posted in About NEWA, Help desk and tagged Help desk, ideas, issues, model, NEWA, questions, troubleshooting, weather station, website on April 15, 2018 by Dan Olmstead.